(Open stickers-Critters) Print the illustrations on adhesive paper and use them to create original stickers for your group. 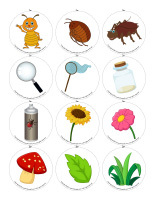 (Open educa-theme-Critters) Print and laminate the different elements representing the theme. Use them to present the theme to your group (and parents) while decorating your daycare. 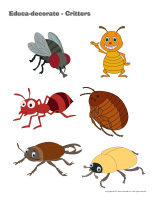 (Open educa-decorate-Critters) Print, laminate, and cut out the illustrations. Use them to decorate your walls and set the mood for the theme. (Open models-Critters) Print and let children decorate the items. Cut them out and string them together to form a garland that can be hung near your daycare entrance or within your daycare. Create a fascinating table centrepiece by setting tiny white Christmas lights in a clear container to represent fireflies. Use empty egg cartons to create caterpillars. Set them inside brown paper lunch bags (cocoons) and hang them from the ceiling. A few days later, replace the caterpillars with paper butterflies. Collect several different critter illustrations and pictures and display them throughout your daycare. Use the walls, cupboards, and even the floor. 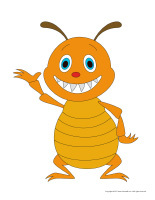 Children will love discovering the various critters as they move around the daycare. (Open new friendly caterpillar) This document was created in response to a special request received. 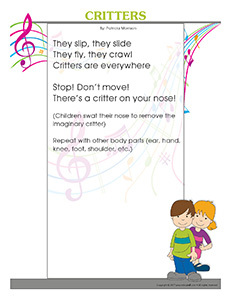 Print, laminate, and display the caterpillar at children's level. Invite children to add the caterpillar's legs. They can, for example, use adhesive putty to stick them under its body. If a child has difficulty respecting a specific rule, have him/her add the corresponding leg. Have fun with the caterpillar and use it to remind children of your expectations. 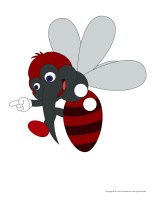 (Open picture game-Critters) Print and laminate the pictures in the format you prefer. Use them to spark a conversation with your group and to ask children questions about the theme. During circle time, hold a fly swatter in your hands. 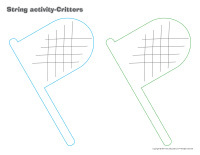 Sit in a circle with your group and use the fly swatter to point to children and ask them to name a critter. If a child is unable to think of a critter, use your fly swatter like a magic wand to transform him. Children can, for example, momentarily become a butterfly, a grasshopper, an ant, or a caterpillar. The pictures may be used as a memory game or to spark a conversation with the group. Use them to decorate the daycare or a specific thematic corner. (Open picture game-Critters) Print, laminate, and store in a "Ziploc" bag or in your thematic bins. 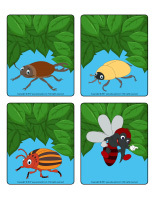 (Open picture game-Critters) Print the pictures twice and use them for a memory game. Activity sheets are suggested for each theme. (Open activity sheets-Critters) Print and follow instructions. 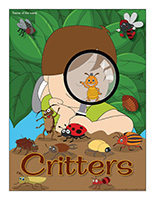 (Open educa-spots-Critters) Print for each child. Use bingo markers to add color inside each circle. If you prefer, you may simply encourage children to set round cereal or add stickers inside the circles. 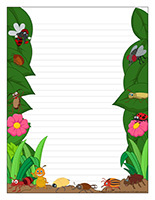 (Open writing activities-C like critters) Print for each child or laminate for use with a dry-erase marker. (Open stationery-Critters) Print. Use the stationery to communicate with parents, in your writing area, or to identify your thematic bins. 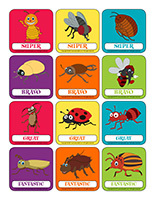 (Open educa-nuudles-Critters) Print for each child. Have children color the sheet and use Magic Nuudles to give it a three-dimensional look. Variation: You don't have Magic Nuudles? Have children fill the spaces designed for Magic Nuudles with bingo markers or stickers. To order Magic Nuudles. Offer only green, black, brown, and red blocks children can use to build giant critters. Drinking straws that can be inserted end to end to create bridges for critters. A butterfly or ladybug shape traced on a clear plastic cover sheet, colourful sand, and glue to create a fun stained glass decoration. Yarn and poster paint for "worm painting". Books about insects or ants. Pictures of different critters to decorate the walls of your area. Connect the dot activities to draw critters. Simon says...to act like different critters. With a jumping rope, draw a wavy line on the floor and invite children to crawl on it like a critter. Pretend to fly like different critters. Place children in a circle and hand one child a ball of yarn. Encourage children to toss the ball of yarn back and forth to create what will look a lot like a spider's web. 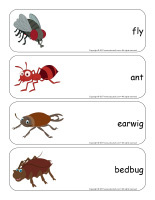 (Open word flashcards-Critters) (Open giant word flashcards-Critters) Print. The word flashcards may be used to spark a conversation with your group, in your reading and writing corners, or to identify your thematic bins. 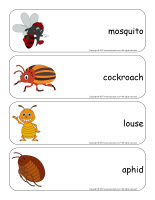 (Open word flashcards-Critters) Print and laminate the word flashcards. Have each child pick a flashcard. They can take turns presenting the word they picked to the group. With your group, talk about each item. Ask children questions to encourage them to share what they know about each one. 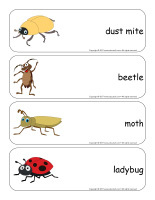 (Open educa-chatterbox-Critters) Print and laminate the cards. Cut them out and place them in an empty shoebox or small container. Add items, pictures, and illustrations related to the theme. During circle time or when children are waiting for lunch to be served, encourage them to take turns picking a card out of the box and naming what they see. (Open story and memory game-Critters) Print, laminate, and cut out the cards. Place them upside down on the floor or table. Children take turns picking three cards and using the illustrated items as inspiration to create a story. Trick: To solidify the cards, stick them on the top of frozen juice cans. (Open word flashcards-Critters) (Open giant word flashcards-Critters) Print two copies of several word flashcards. Hang one copy of each word on an indoor clothesline with colourful clothespins. Arrange the copies in a pile on a table. Let children take turns picking a word and finding the matching word on the clothesline. When they find a match, they can place the flashcard on top of the one that was already hanging on the clothesline. Help younger children manipulate the clothespins if necessary. 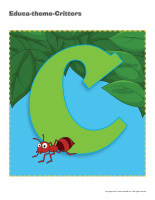 (Open word flashcards-Critters) (Open giant word flashcards-Critters) Print several word flashcards and hide them throughout your daycare or yard. Divide your group into two teams. When you give them the signal, children must search for the flashcards for a pre-determined period, for example three minutes. When the time is up, children must be able to "read" their flashcards to earn a point for their team. If they are unable to find the correct word, the other team can earn the point if they succeed. (Open transition games-Critters) Print, laminate, and secure the illustrations on the floor using adhesive paper to create a path. The path may lead to areas children visit daily such as the bathroom, the cloakroom, etc. The illustrations may also be used to delimit your various workshops. (Open transition games-Critters) Print each illustration twice. Use adhesive paper to secure one copy of each illustration on the table. Deposit the second copy of each illustration in an opaque bag and invite children to pick a card that will determine their spot at the table (corresponding illustration). The illustrations can also be used to determine children's naptime spots or their place in the task train. (Open dice-Critters) Print, laminate, and cut out the illustrations. Stick each illustration on one side of a cardboard box. Children take turns rolling the die and miming the illustrated critter. The other children try to identify it. Fill a container with various items related to the theme. The only rule: children can only explore the contents of the bin once they have washed their hands. Set various critter illustrations on the floor and encourage children to hop or walk on them on one foot, on two feet, like a frog, etc. Children will develop their motor skills with every move. Print several different hunt and seek activities related to the theme (see educatall club). Arrange them on your table and cover them with adhesive paper. Give each child a few cards. As they wait for their meal or snack, children will enjoy searching for the items. (Open miniature critters) Print and laminate. Hide the critters throughout your daycare and invite children to hunt for them. The child who finds the most critters can hide them for the next round. (Open models-Critters) Print, color, and laminate the models. Glue them on magnetic paper and set them on a table along with a baking sheet. Children will enjoy sticking the critters on the baking sheet to create a variety of scenarios. Insert a battery-operated tealight in several balloons before inflating them. Turn the lights off and let children have fun tossing the balloons up in the air. For a fun variation, use glow sticks instead of tealights. Close your daycare curtains and blinds and turn the lights off. Set up an obstacle course and hang glow sticks here and there. Children must collect the glow sticks as they complete the obstacle course. When they reach the end of the course, help them connect the glow sticks to form a circle of light. Glow sticks are easy to find in big-box and dollar stores. Use the bracelet size for this activity. 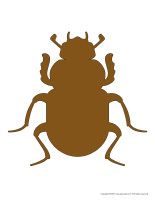 Hide several tiny insects within your daycare. Give each child a flashlight and tell them they are fireflies. They must hunt for the insects. Every time a child finds an insect, he must say, "I found an insect!" and give it to you. Children hold hands. They must follow the rhythm of the first child in line and, for example, walk very slowly or very fast, stomp their feet heavily or walk on their tiptoes, pretend to climb a tree or ladder, etc. 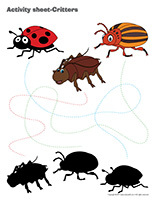 (Open string activities-Critters) Print for each child. Children trace the lines with white glue and then position string or yarn on the lines. You will need four shallow containers. Add one of the following to each container: sugar, maple syrup, salt, flour. Set the containers close to ants and observe them to see which container they will be attracted to. Repeat the activity with other types of insects. Children stand one behind the other, holding the waist of the child who is in front of them. The first child in line determines the direction of the caterpillar. The caterpillar can move forward, backwards, sideways, quickly, slowly, stomp its feet, walk very quietly, stand tall, crouch down, etc. Where are the critters hiding? (Open miniature critters) Print. Hide hundreds of critters in your daycare toys and bins. Every time children find a critter, they must say, "I found a critter!" before handing it to you. (Educa-symmetry-Critters) Print. Children must color the picture on the bottom to make it look exactly like the picture on the top. (Open color by number-Critters) Print for each child. Children must color the picture per the color code. 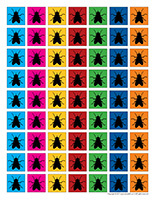 (Open dominoes-Insects) Print and laminate the dominoes. Children pick five dominoes each. Arrange the other dominoes in a pile, except for one that is placed in the centre of the table. Children take turns trying to match an item to an item on the end of the available dominoes. If they cannot play a domino they already have, they must pick another one. If they cannot play it either, their turn is over. Arrange several plastic insects on a table and encourage children to observe them closely. Hide them with a blanket. Remove one insect, making sure children don't see which one you removed. 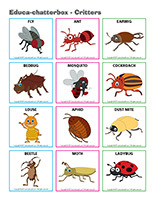 Take the blanket off and invite children to identify the missing insect. You will need five paper drinking glasses. Number them from 1 to 5. 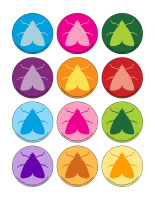 Children must deposit the correct number of insects in each glass. (Open ladybug) Print and laminate. Stick pieces of Velcro on the various parts. Cut circles out of black construction paper and stick pieces of Velcro on them too. Children take turns adding a specific number of spots to the ladybug. Select a child who will pretend he is a critter. The critter must try to catch one of his friends. When he touches another child, he must tickle him. The child who is tickled becomes the critter for the next round. You will need three shallow containers. Add one of the following to each container: sugar, maple syrup, salt. Set the containers close to ants and observe them to see which container they will be attracted to. Use butterfly nets, magnifying glasses and containers to hunt for critters. You may also punch holes in plastic containers so that any insects children capture can breathe. Explore your yard with your group, looking for critters in bushes, grass, soil, etc. Set four or five hula hoops on the grass in your yard. Children take turns hopping from one hula hoop to the next like grasshoppers. Hold a long rope in your hands. As you walk around the yard, wave it from side to side. Children follow you, trying to step on the "worm". Invite children to hold the edges of a blanket. Set a tiny ball or cushion on the blanket to represent a butterfly and encourage children to move the blanket up and down to make it "fly". Children stand in a circle around you. Use your arm to indicate a direction. Children must run in this direction as quickly as possible. Change direction several times. When you call out, "beehive! ", children must rapidly gather around you like bees in a beehive. Provide pictures of different critters and have children hunt for them. Observe any critters they capture with magnifying glasses. Children are on a line at one end of your daycare or yard, on all fours. When you give the signal, the race begins. They must crawl to the finish line. Children stand on a line. When you give the signal, the race begins. Children must flap their arms like a butterfly and race to the finish line. Children lie down on the floor, on their stomach. When you give the signal, children slither towards the finish line. Divide your group into two teams. Children from each team stand in line, holding the shoulders of the child in front of them. They must walk in a synchronized fashion, moving their right or left foot at the same time as the leader. 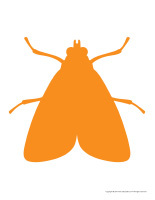 (Open luminescent firefly) Print and cut out the various firefly parts. Have children insert a glow stick in a plastic Easter egg before gluing the firefly parts on it. They will enjoy setting their luminescent firefly next to their mattress at naptime. Give children a flashlight. Turn the lights off and close all curtains and blinds so it is as dark as possible in your daycare. 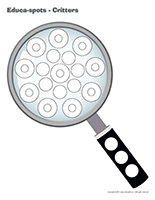 Encourage children to walk around the daycare, using their flashlight to observe objects. Hang tiny multicoloured Christmas lights under a table. Drape a blanket over the table to create a tiny hideout. Every day, select a child who will become a critter. Let him use the critter home as he wishes at different times during the day. For example, you may let him pick a friend to read a book or eat the morning or afternoon snack in the critter home with him. The child may also sleep in the critter home at naptime. You may set a box filled with objects that light up in your critter home. Children will love to explore its contents. Turn the lights on and off in a rhythmic fashion. If your group is very active, this may represent a great way to calm children or to signal that it is circle time, among other things. Have fun flashing the lights often during the theme to provide children with the opportunity to practice gathering more quickly. Use this activity to explore the importance of electricity. Press a luminescent sticker on the tip of a Popsicle stick. Turn the lights off and recite a poem related to the theme as you wave the Popsicle stick in the air. Hide several plastic critters in your yard (or daycare). Children must hunt for them. Stick several critter pictures on the top of frozen juice cans and set them in a kiddie pool or large container. Create a fishing rod by sticking a magnet on the tip of a string attached to a stick. Children will enjoy fishing for critters. Purchase a bag of wood chips (for hamster cages) and empty its contents in a sensory bin. Hide critters among the wood chips. Fill a large container with sand and hide plastic critters or laminated pictures of critters in the sand. Children can take turns using a fork to scrape them out of the sand. Add a glow-in-the-dark sticker to the tip of a Popsicle stick for each child. Turn the lights off and invite children to wave the "fireflies" around to observe this interesting phenomenon. Deposit a glow stick in two different bowls. Pour lukewarm water in the first bowl and cold water in the second bowl. With your group, observe the glow sticks to determine whether fireflies shine brighter in hot or cold water. Photocopy pictures children have found or use pictures provided by parents. Cut them and stick them on 10 cm x 13 cm pieces of paper. Slide the pictures in Ziploc sandwich bags, placing two pictures back to back in each bag. Staple the bags together at the closed end so you can open them if necessary. Use colourful adhesive tape to cover the staples. Children will love admiring their critter book. For each child, you will need two Ritz crackers, cream cheese, raisins, and a piece of colourful fruit (kiwi, orange, pineapple). Spread cream cheese on the first cracker and set the piece of fruit in the centre. Break the second cracker in half and position each piece on either side of the first cracker to represent wings. Add two tiny dots of cream cheese and press a raisin on each one (eyes). (Open models-Critters) Print and let children decorate the critters as they see fit. Cut them out and hang them within your daycare or close to your daycare entrance. (Open puppets-Critters) Print the puppet models on heavy cardboard. Have children cut them out and decorate them with a variety of arts & crafts materials. Stick a Popsicle stick behind each one to complete your puppets. 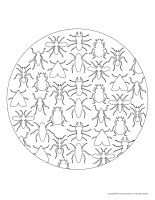 (Open mandalas-Critters) Print for each child. Invite children to color the mandalas at certain times during the day to help them relax. (Open firefly jar) Print a jar for each child. Have children press their thumb in glow-in-the-dark paint (or yellow paint) and make prints inside their jar. Help them use fine black markers to draw wings and antennae to complete their jar full of fireflies. You will need an empty water bottle for each child. Have them glue pieces of tissue paper all over their bottle. Once the glue is dry, insert one or two glow sticks inside each bottle. Seal the caps with hot glue. Encourage children to draw a critter face on their bottle. Provide black pipe cleaners that can be used to represent antennae. Hang the bottles from the ceiling within your daycare. (Open masks-Critters) Print and trace the models on cardboard. Children can decorate their mask as they wish. (Open finger puppets-Critters) Print the models. Have children decorate them and cut them out. Show them how they can insert their fingers in the holes to move the puppets. 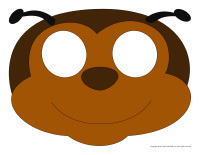 (Open educa-decorate-Critters) Print and cut out. Children glue the items around a strip of construction paper to create special hats they will love to wear as they explore your yard. (Open I am learning to draw-Ladybugs) Print and laminate the model sheet. 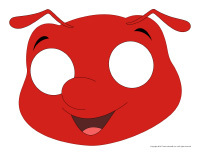 Invite children to practice their drawing technique on the model sheet before trying to draw a ladybug independently. 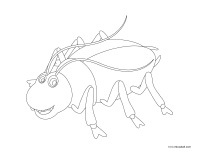 (Open coloring pages theme-Critters) Print for each child. 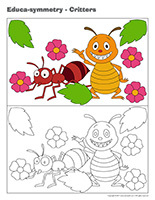 (Open creative coloring-Ladybugs) Print for each child. Invite children to complete the drawing as they see fit. There's a critter on your nose!